High on a forested mountainside sunlight flickers through the trees. The sparkling hot tub is a real treat after exploring the Smokies. Fire up the grill and enjoy your cookout favorites. 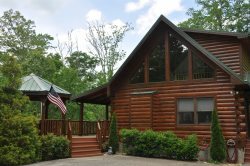 Deep Creek Fishing Retreat has 2 Bedrooms and 2 Baths. The main floor bedroom has a private bath and a Queen sized bed. The upstairs open loft has two twins and a private bath. The living room has a sleeper sofa. The first bathroom has a tub and shower combination. The second bathroom has a shower stall. Deep Creek Fishing Retreat is conveniently located to fishing, hiking, waterfalls, stand up paddle boarding and more. A hub for fishing, tubing, mountain biking, hiking, and picnicking, the Deep Creek area has miles and miles of trails ranging from easy strolls by waterfalls to more adventurous hikes. Mountain bikers can enjoy one of the few park trails where bikes are allowed. Deep Creek has a lot to offer making it one of the best loved entrances for the Great Smoky Mountains National Park. After a long day of adventure enjoy the hot tub on the deck. Your cares will drift away as the bubbles surround you. • Open Deck with Rocking Chairs, Picnic Table. We had such a great vacation. I was proposed to at the waterfalls. Will never forget. Thank you for making this so comfortable for us. Everything was absolutely wonderful! It was so relaxing! The hot tub was fantastic and the cabin just perfect for our needs. From the moment we pulled up to the cabin we knew we made the right decision. The place was stunning and exceeded our expectations. Looking forward to next year. The cabin was very clean and neat and had everything we needed. We went hiking at all the nearby trails with all the waterfalls was the most fun we've had as a family in a long time. Visited nearby Newfound Gap and fulfilled my promise to my daughter to see snow. The cabin had all the essentials and was very neat, clean and tidy! We loved sitting on the deck and using the grill, a perfect way to celebrate our 2nd Anniversary! My husband and I stayed here to celebrate our 2nd anniversary and we absolutely loved it! We really enjoyed visiting all of the shops in town and trying the local restaurants. We visited Cherokee in search of waterfalls. Rode the train and toured the shops in Dillsboro. We went snow boarding and skiing at Cataloochee!Overall, and amazing trip and can't wait to come visit again! Third time to Bryson for Mom and I. This little town will forever be our home away from home. Back in 2013, we stayed in this cabin with my brother who passed away in 2016, so we make it a family mission to spend his anniversary up here in the mountains, continuing to make new beautiful memories! Thank you for such a wonderful little home to stay in. This was our first visit to the Bryson City area but certainly won't be our last! We had a great time horseback riding. We went rafting down the Tuckaseegee river. We try the Nantahala next. Tubing at Deep Creek was a blast. Thank you all, we will be back! We enjoyed our stay here. It was a perfect, "summers not over yet" get away. Our family enjoyed hiking the waterfalls, Juneywhack, Indian and Tom Branch. We also rafted at the Nantahala River. We hiked up to Clingmons Dome. We loved spending a few minutes in the Hot Tub after or long days walking. We definitely have much more on our to do list when we come back. This was our first trip to the area. The cabin was more than we expected. The views are incredible. We stayed very busy, hiking, white water rafting, zip- lining, tubing and visiting Cherokee. We loved the cabin, very spacious. The GSCR team was very helpful. We really enjoyed the cabin! We went Fishing, wine tasting, hiking, shopping, and visiting Smokey Mountains National Park. We had a wonderful time. We came here for a short family getaway. A family of 5. We enjoyed playing Dominoes, having the fireplace on, and the hot tub was fun too. We went on the Great Smoky Mtn Railroad and wandered around in Bryson City and Cherokee. Thanks for a great time! The cabin is well kept and clean. The decor is adorable as well. We also loved the sunny deck and the hot tub. The staff was very friendly and very helpful. Most modern and clean-looking cabin in the area. We enjoyed the porch and rocking chairs. Also proximity to Bryson City and National Park was excellent. We had a wonderful sprig break!! The cabin was perfect and the city is adorable! We did a lot of hiking and exploring the surrounding area. The weather was perfect as well. Thanks for the wonderful memories. The staff was friendly and great ! WE loved everything about the cabin. WE enjoyed our romantic getaway. I thoroughly enjoyed our stay at Deep Creek Fishing Retreat.. The property was comfortable and secluded, it was everything we wanted. We looked at several places but this cabin offered what we were looking for. I called the office and Kathy was working on Saturday, was so informative and attentive that I decided to book because of her. It snowed on one night of our stay and it was wonderful to sit in the huge hot- tub. It was over all a great experience and I hope to stay with with GSCR again. We had a great little weekend getaway! We didn't want to go home! What a great place! We have been here several times and it is still great! We enjoyed the areas beautiful waterfalls, especially pretty with the ice. The cooler temperatures made the hot tub even better. We look forward to coming back again!